Crestron is arguably the most famous name in the home automation niche, and for good reason. They have built up an enviable reputation over the last four decades and are widely considered to be one of the best home automation systems due to their innovation in the sector. Crestron was able to get this reputation thanks to their attention to detail and because of how they were able to streamline all of their different technologies into one controllable smart device, which you can control to fit your needs. 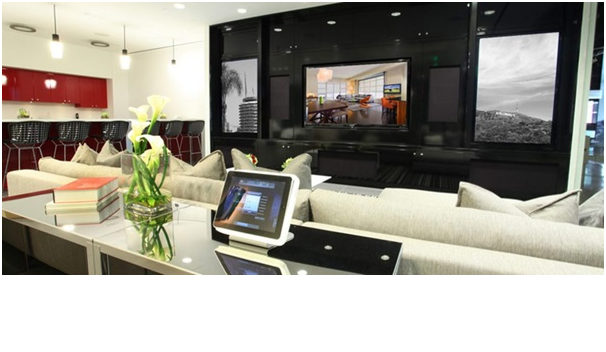 So, what can Crestron home automation technology offer you? Crestron systems allow you install a home audio-video system, lighting and security. It can also help with setting the heating, as well as switching on and off lights. Thanks to the motion detectors, it can track who enters and leaves a property, which is perfect from a home security point of view. When you leave your property, the system will automatically shut down any unused systems. This saves energy and money as a result.The Automatic light control in your home is my favourite part of the system. Crestron Lighting does this very well and you’ll enjoy walking from room to room with lights automatically being switched on and off. It is certainly wellmade and I believe is totally fit for purpose, which is more than can be said for other lesser known automation systems. It is possible to also install video cameras in different areas of your property, which is great from a security point of view. Crestron also excels in terms of entertainment too. We are confident you will love the home cinema experience that Crestron provides, and will certainly give you many hours of enjoyment. You don’t necessarily have to have a massive room in order to make this a reality. There are a number of different space saving techniques that can be used, such as putting speakers behind the projector screen. It will certainly change the way you view your TV and films! So yes, if you are looking for a home automation system, Crestron are your go-to suppliers. For more information, check out Custom Controls who have a number of example Crestron home installations on their website and can install a system in your home, or produce you with a quote.